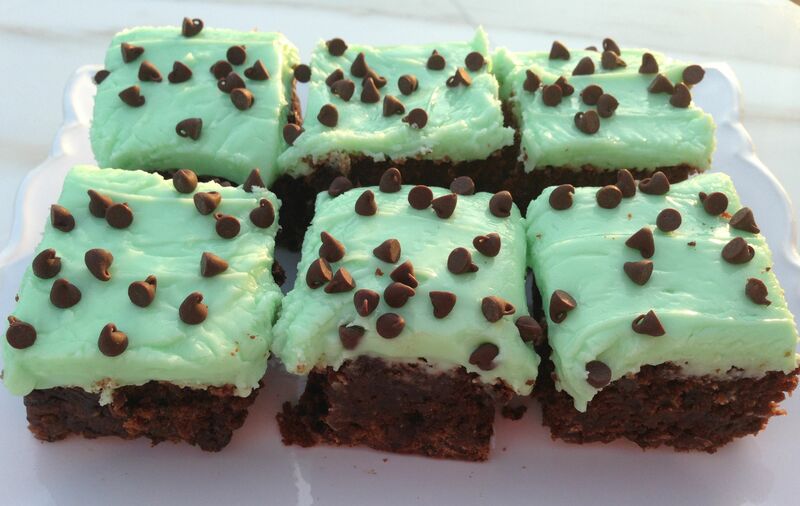 With St. Patty’s Day right around the corner, it’s only fitting to share a mint chocolate dessert. I absolutely love mint chocolate sweets, although for some reason I don’t tend to crave them. Put one in front of me though, and I won’t turn it down, and I’ll devour it. It’s a timeless combination. 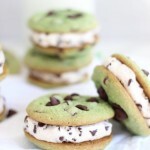 As a kid, my favorite ice cream flavor was mint chocolate chip and that’s still a top fave today. After pulling little bits and pieces from some of my favorite brownie recipes and smashing them altogether into one super-charged recipe, I took a bite of these and immediately thought that they fortuitously (but not purposefully) have an ice cream essence about them. 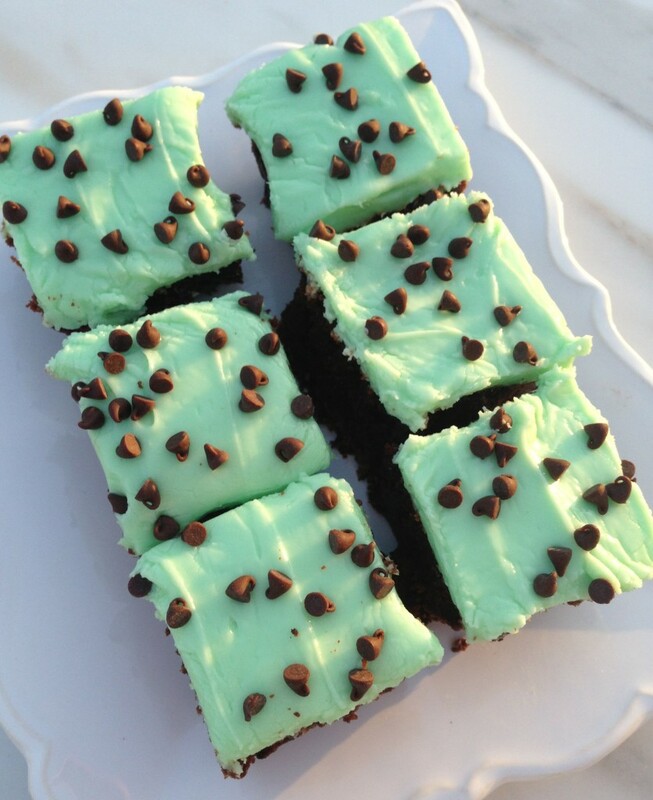 I was immediately reminded of that love I have for mint chocolate ice cream because this tasted like that awesome frozen dessert, but in brownie form. Goooosh, they’re so good. I am not Irish, and my S.O. is 100% Italian, as I’ve mentioned in the past. Yet, like many red-blooded people, we cease the opportunity to join in all the festivities and debauchery that make up St. Patty’s Day because… well, we’re human and we like to have a good time. That needed no explanation though, right? Despite that S.O. is Italian and hangs with a large clan of very Italian friends (I don’t think he’s in the mob though, no), we do St. Patty’s Day BIG. Like, reaaaaally big. He’s originally from Buffalo, NY, and apparently they have a HUUUUGE parade there. Even though I was from Erie, just 90 miles down the road to the west, I had no idea about this massive, boisterous festival that took place. Seriously, so many people attend that we lose cell phone reception which hasn’t happened to me since college football weekends circa 1999-2000. It’s a crazy event and an insane amount of fun. The local bar that we claim as our hangout for much of the day always has stacks of Guinness cupcakes and green sugar cookies sitting around among frosted mugs of green beer. Yum. Sounds kinda gross actually now that I’m describing it to you. Trust me, if you’ve been imbibing, those desserts look and taste mighty good. Beer and cupcakes. Mmmmm. 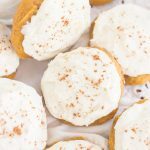 I want to contribute this year with my own St. Patty’s inspired treats to snack on throughout the day in between beer, corned beef, and cabbage. These are coming with me this year, for sure. 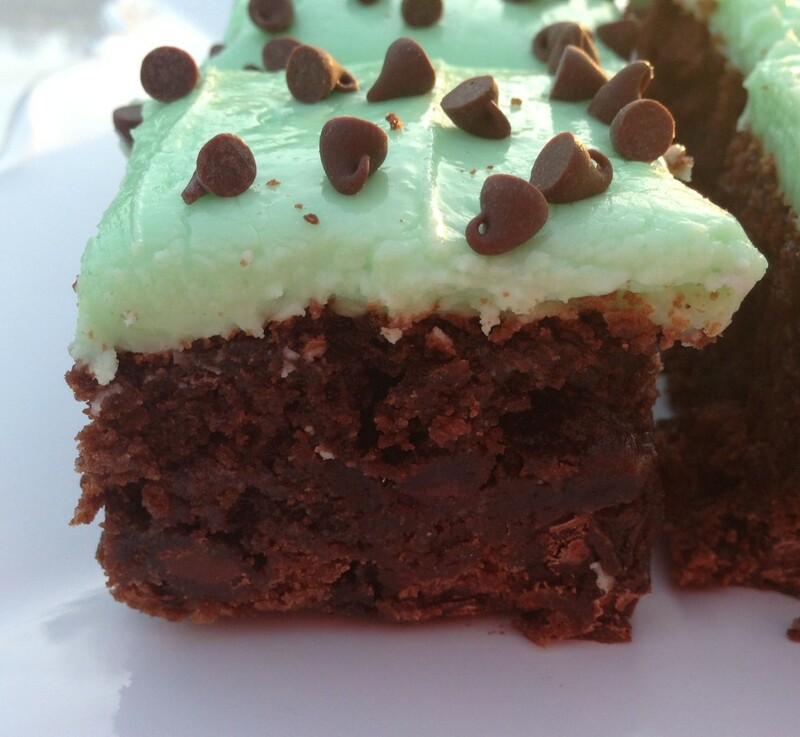 About these… they’re chock full of chips, both semi-sweet chocolate and mint, so they are super melty and gooey inside, besides that these brownies are really thick and fudgy to begin with. The chocolate decadence abounds in these nuggets. Yes, I totally used a brownie mix, but no one would ever know that because it’s been successfully doctored up and disguised VERY well. 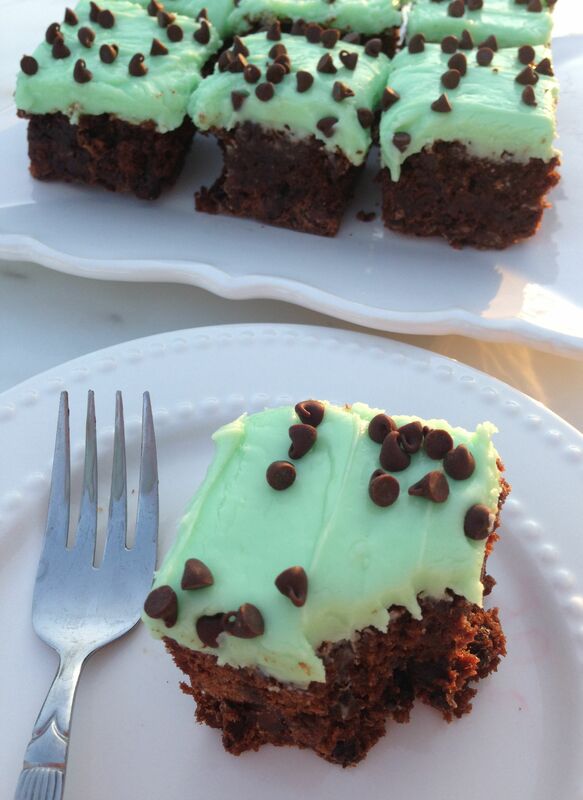 I wanted mint flavoring in both the brownies and the frosting so that the flavor is amplified and cohesive. 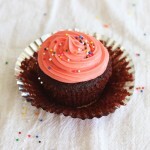 The frosting… gaaaaah. 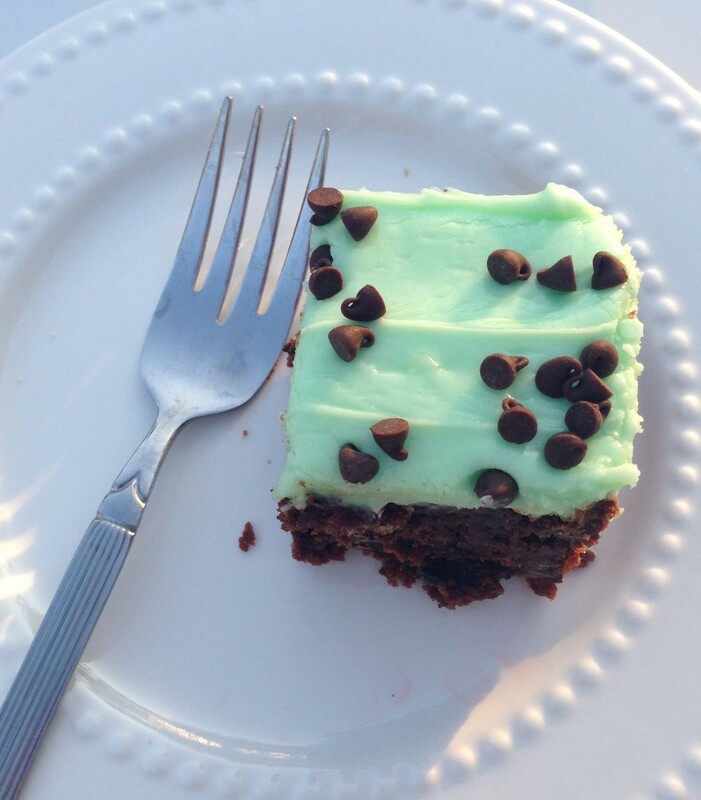 I never knew a cream cheese frosting I didn’t like, and this minty one does not disappoint. 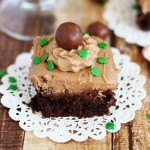 Garnish with a few extra chocolate chips on top? Dying. So freakin’ delicious. I’ve been dousing them with chocolate fudge ice cream = sublime. These are a serious problem for my waistline. #worthit. Prepare brownies according to box instructions, but add an extra egg. 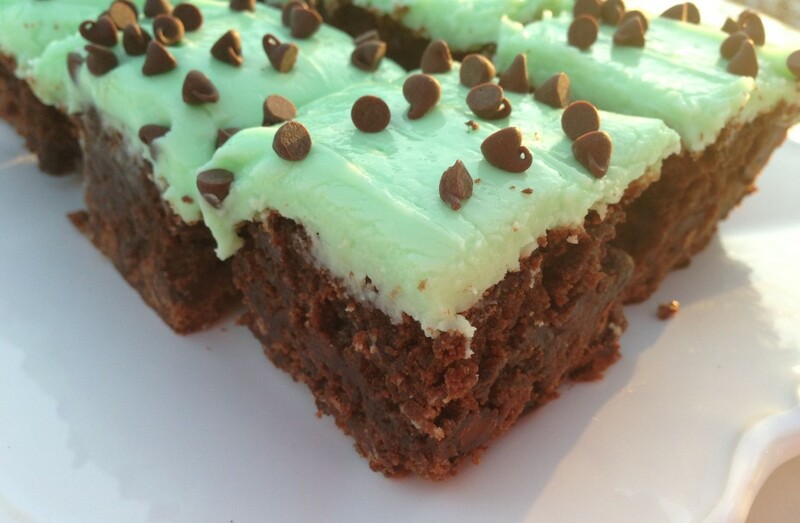 Add in mint extract, Andes Mints baking chips, and semi-sweet chocolate chips. Spread into greased 8×8 pan. Bake according to box instructions. In this case, I baked the brownies at 325 for 40 minutes. Allow to cool completely. 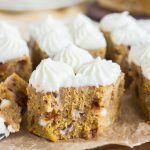 In a large mixing bowl, combine cream cheese, confectioners’ sugar, mint extract, and just enough water to create a very thick frosting. You’ll want this to be spreadable, but not so that it will be runny. You can adjust the amount of confectioners’ sugar and water to achieve the proper consistency, if needed. 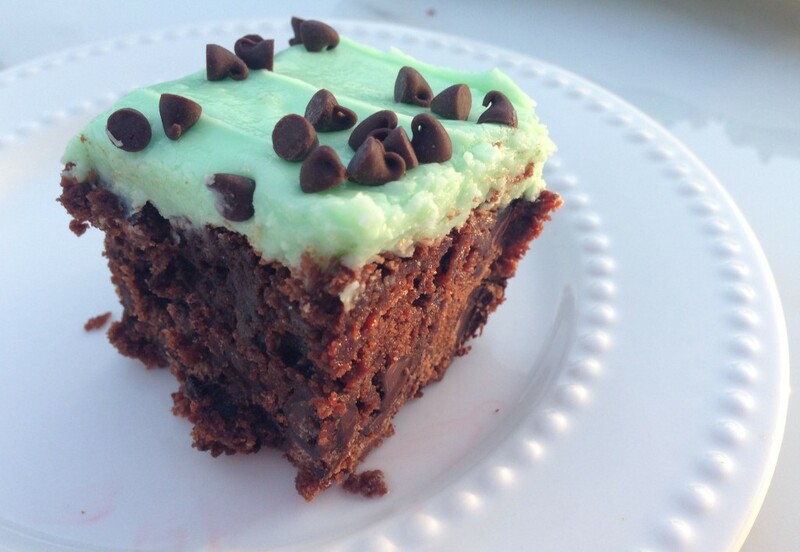 For color, add 1-2 drops green food coloring, if desired. 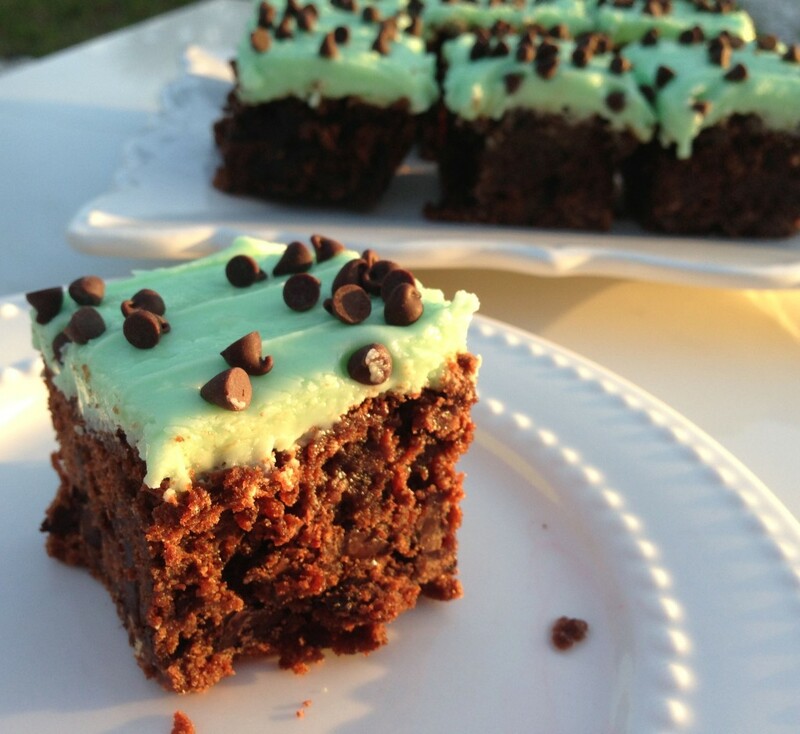 Carefully spread frosting on cooled brownies. 1/4 c. mini or regular-sized semi-sweet chocolate chips. Scatter across top of frosted brownies. Cut and serve!